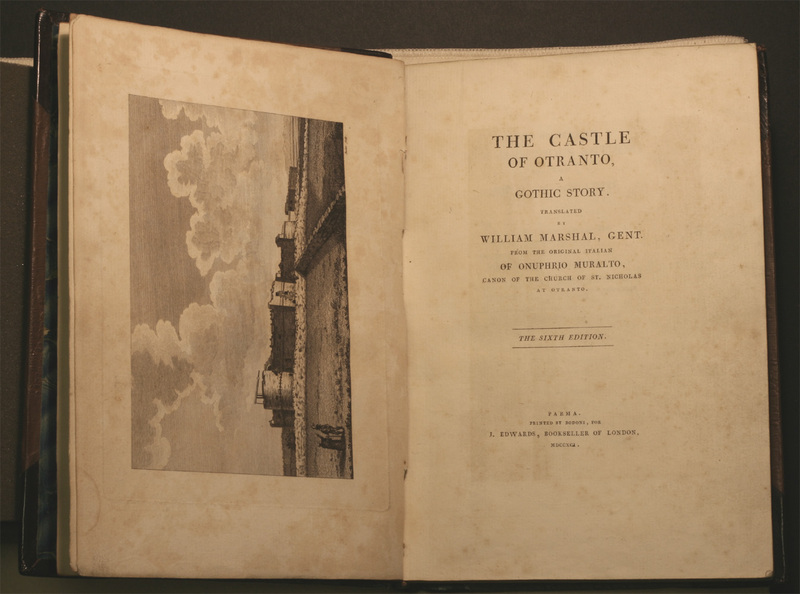 The castle of Otranto : a gothic story : translated by William Marshal … from the original Italian of Onuphrio Muralto … / [Horace Walpole]. Parma : Printed by Bodoni, 1791, : for J. Edwards, Bookseller of London. Giambattista Bodoni (1740-1813) was an Italian typographer and publisher. His best-known typeface is probably “New Face”, designed in collaboration with Firmin Didot – the letters are cut so as to provide a strong contrast between their thick and thin elements. He was also reknowned for the beauty of the composition and layout of his pages. However, it seems that Walpole was not entirely satisfied with Bodoni’s edition of “The Castle of Otranto” – in a letter to Mary Berry, 20th December, 1790 he wrote: “I am glad you did not get a Parmesan Otranto. A copy is come so full of faults that it is not fit to be sold here”. The publication required many corrections.